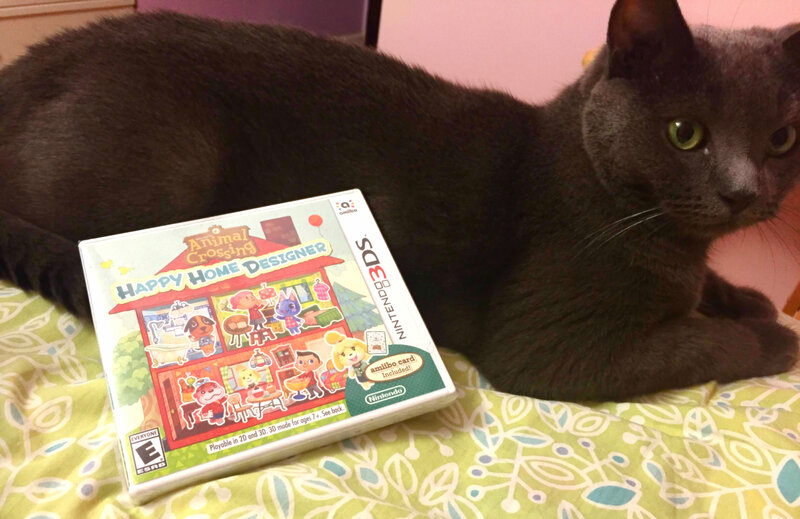 😀 I got Animal Crossing Happy Home Designer in the mail! I haven’t played it yet, but I plan to on my commute tomorrow… which means farm life (Story of Seasons) may take a back seat for a week or so… along with all the other things I’m supposed to do but keep putting off (oops). 😀 I could potentially carry a girl in each pocket! My bag is going to be only 2 colors (pastel minty green for the body and cream as an accent. I’m hoping it doesn’t end up looking like a baby bag), and I’m using acrylic yarn and not cotton because it was more cost effective that way. The whole bag is done in single crochet stitches, doubling up the yarn, and using a 4mm hook. Ugh. Single crochet at this scale is the WORST because it takes forever to crochet something as big as a bag. 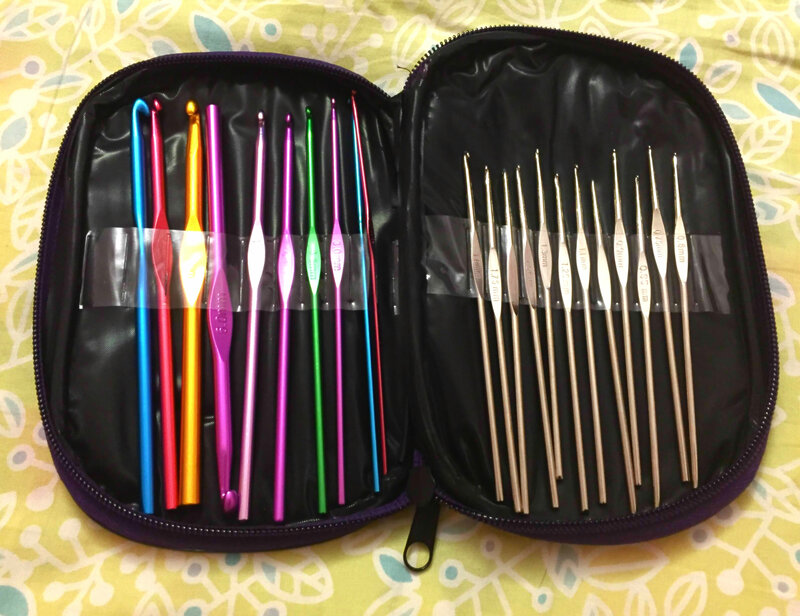 So far, I have 3 out of the 4 sides of the bag done… I still have the one large side to finish, as well as the base of the bag, the handles, and the pockets. 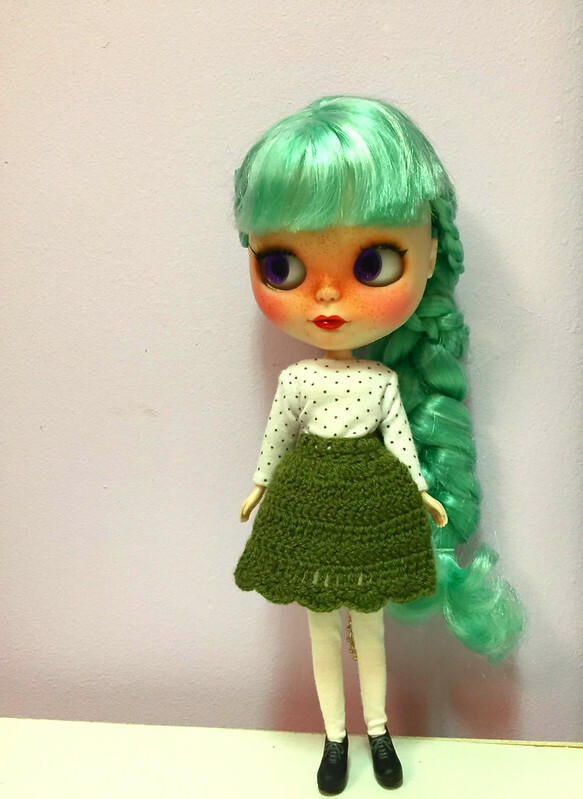 I WILL finish this thing by Blythe Con Chicago! I think, if I were to make this bag again, I would just go for the yarn it specifies in the pattern (Lily’s Sugar and Cream cotton yarn). I do find acrylic easier to work with, but I think I would have preferred a cotton bag over a slightly fuzzy acrylic yarn one. Also, even though the weight of the yarn I bought is the same as the one specified in the pattern, I’m not dealing with the same issues I’ve read about in other people’s comments on Ravelry. Unlike a lot of other crocheters, I’m not finding the double yarn strands difficult to crochet with a 4mm hook. Additionally, I’m also worried that the bag will stretch out too much since it’s made out of acrylic. 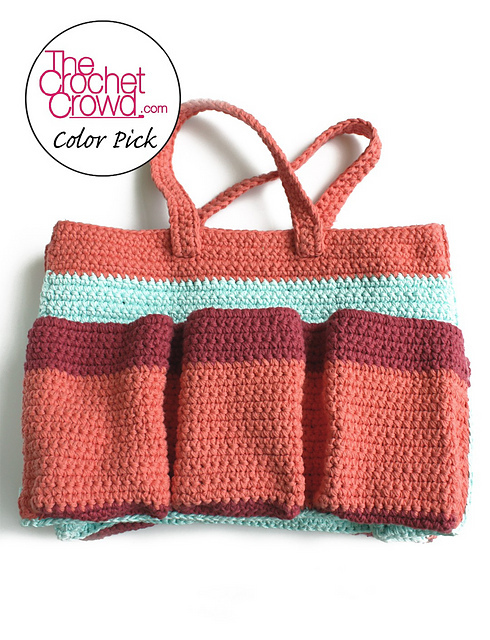 The next time I make this bag, I might use the half double crochet stitch instead of a single crochet stitch. 😀 And I’ll pick wilder colors! When it starts looking more like a bag, I’ll update the blog with some progress photos ^^. One stand, two stand, red stand, blue stand. *\o/* The clover stand I ordered from eBay came in today, so now all of my girls have a stand. I kind of like how each girl’s stand compliments them in a way. Finley came with a black clover stand (she’s a neutrals girl), Bryn came with a mid tone pink stand, and the rest I purchased from eBay. The stand that came in today is the yellow one currently being used by Rory. 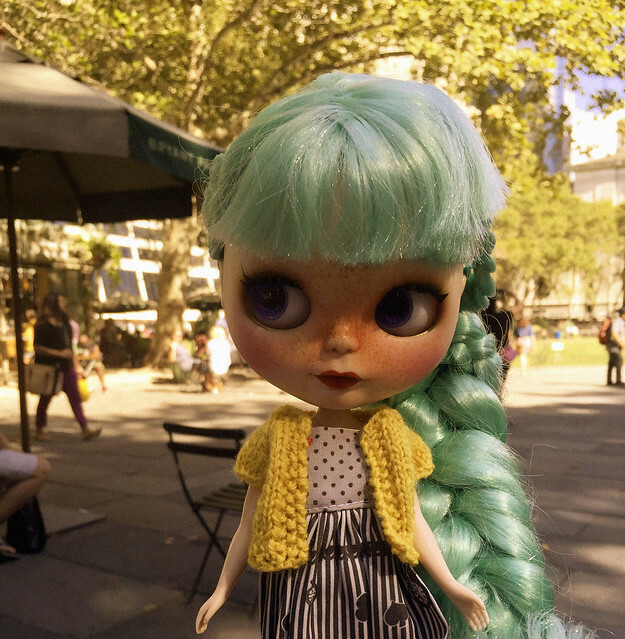 I gave Rory’s slightly translucent blue stand to Marina, and gave the new yellow one to her. I’m pretty happy with how the stand situation worked out because the listing I won was for a random color stand. And just for posterity, Rosaline is on a light pink stand. I actually also removed Rosaline’s sleep eyes today. Her lids kept drooping, despite how heavy her pull string was. 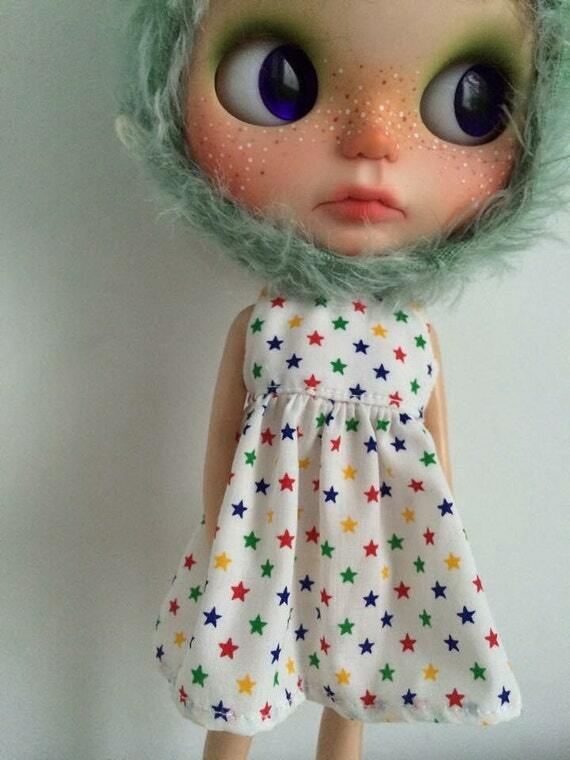 Her eye mech sticks on one set of eyes, and I think it’s due to the spring. Eh. Ain’t no thing. This is what has become of the spare face plate I bought. She is going to become a cat girl. I’m still working on carving and sanding at the moment (but giving my poor hands a break). I’m a little unnerved with this kind of carving, because I usually carve with the lines already on the face plate. 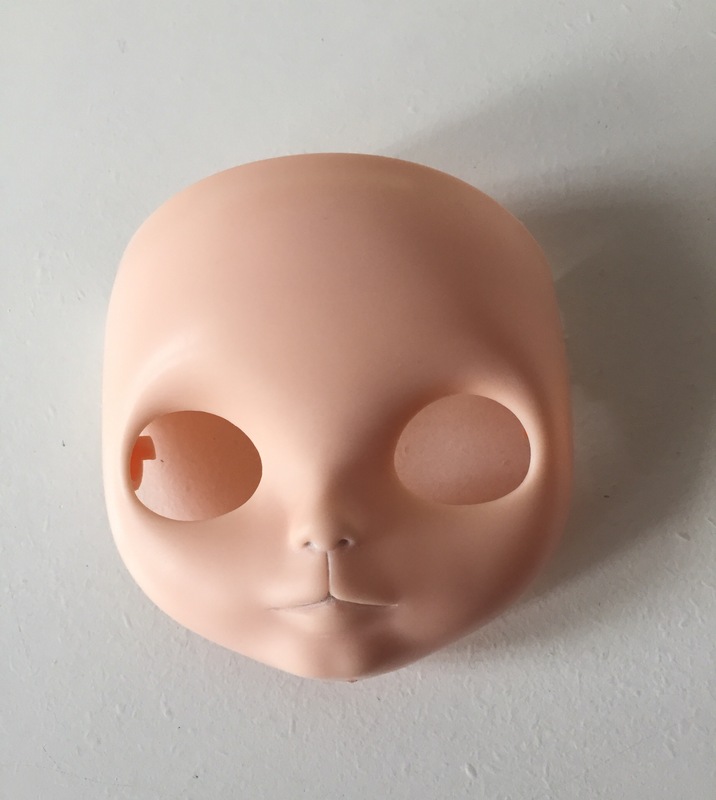 But the plus side is, at this point I only have the face plates and nothing else, so it’s not like I have a full doll and irreparably messed up her face. I will be scavenging for parts on eBay and Facebook ^^. I’m still struggling to find a dress or outfit that looks made for Marina. I still think she looked best in that blue and white checkered dress with the super poofy skirt that I first put her in, because of the silhouette of the dress (tight fitted bodice with a full skirt kind of reminds me of mermaids, or maybe Ariel?). 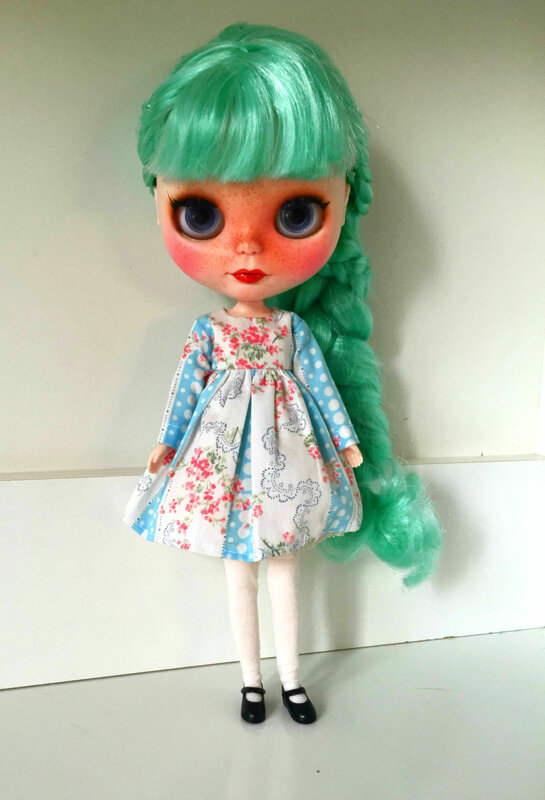 I was able to pick up my package that I ordered from MINIJIJO, as it was sitting in the post office for about a week, and it included a light blue dress I thought might look cute on Marina. I kind of feel like it misses the mark… the dress itself is cute though! I ordered five tutus and two long sleeved dresses ^^. 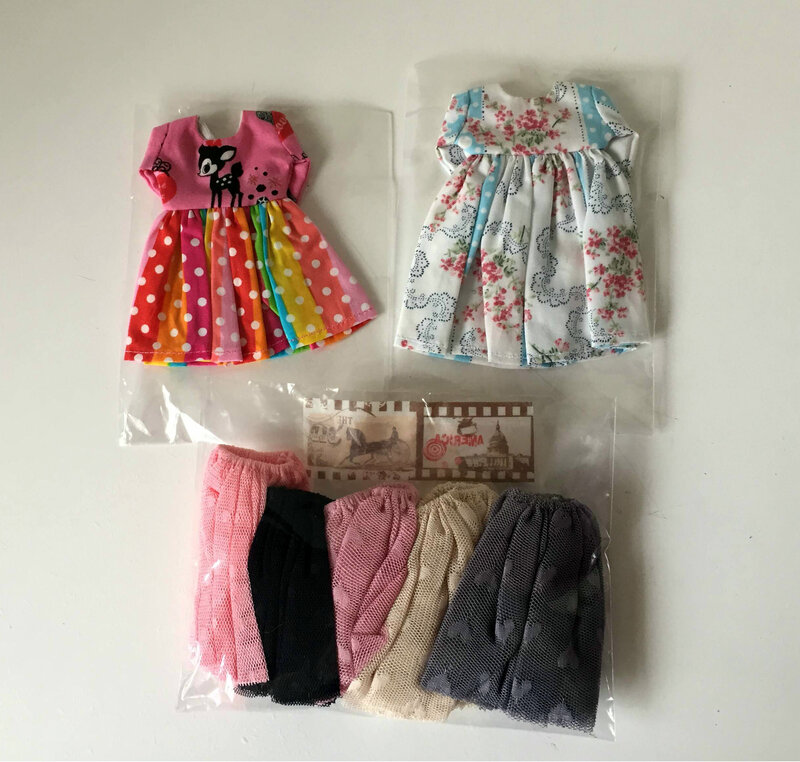 That rainbow deer dress is kind of amazing.All in all, I’m happy with my order from MINIJIJO, as I was in desperate need of separates. The tutus will be used as skirts, as well as underskirts (? … not sure what they’re called, but they will be giving my dresses some volume 😀 ), and long sleeved dresses are perfect for the fall. I actually have my eye on a few other things in the store. The prices are attractive, and the dresses I purchased are well made, so I will definitely be a return customer. The main things that my current dolly wardrobe are missing are darker colors (I have an irrational fear of staining), middie clothes, and separates! 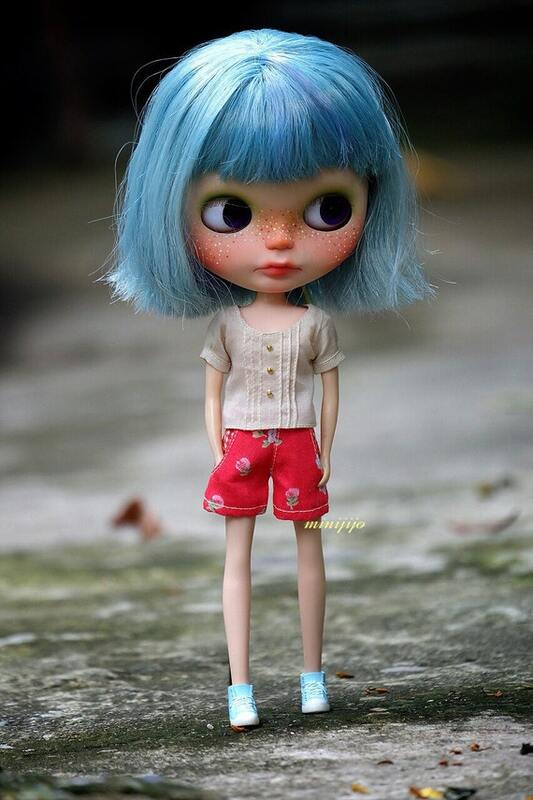 And weirdly enough, only two of my girls have underwear… so I guess I’m missing dolly undies. 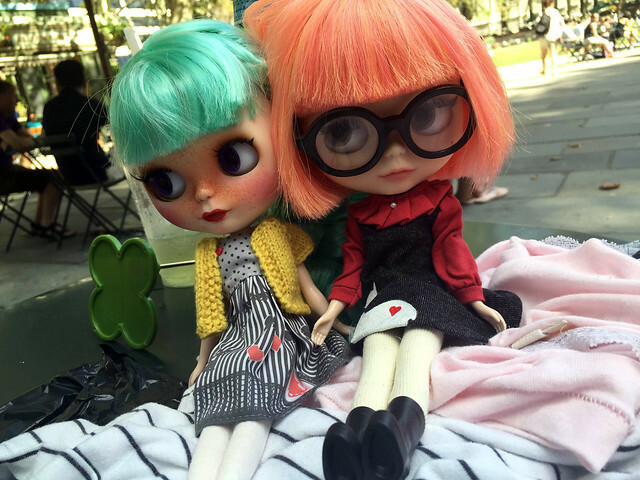 I’ve been trying to curb my doll-related purchases in order to save up for Blythe Con, but I’m not sure how successful I’ve been. My yarn buying has also been kind of out of control this past month >_<. 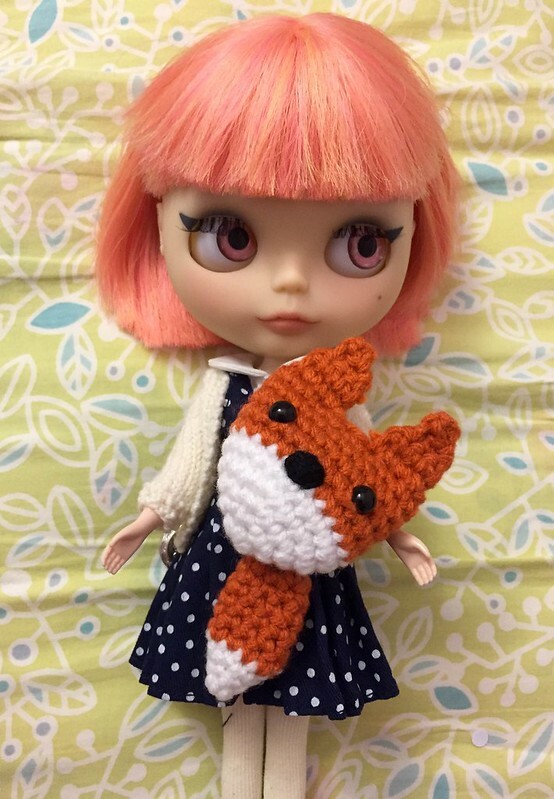 I have a few long-term projects lined up (a bag with blythe sized pockets for toting the girls and my purchases around at Blythe Con, a top for me, and some World of Warcraft related amigurumi), and I’ve also finished a few quick projects. 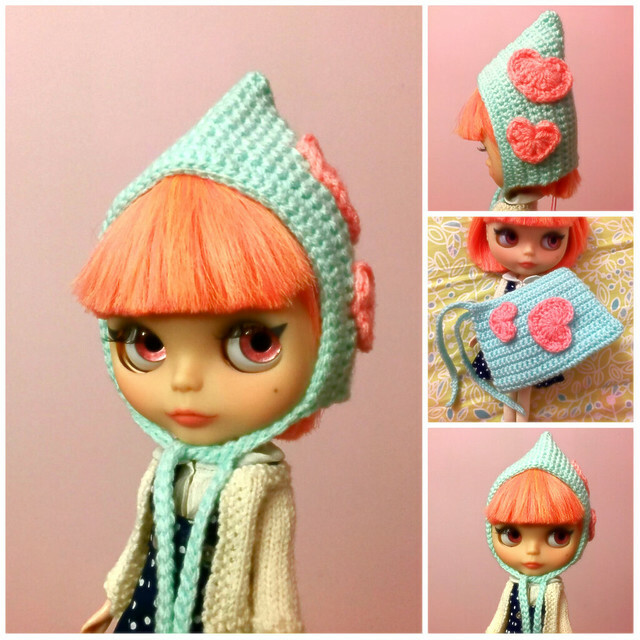 Tomorrow, I start the Blythe carry bag! >_< The projects that take up a ton of time always feel like such a marathon to me. I loathe leaving things unfinished, but with big projects I’m unable to crochet for more than a couple of hours at a time. Even though I may take a physical break from crocheting, my brain is still thinking of all the stitches that need to be done. .Hopefully 3 weeks is enough time for me to get it done! 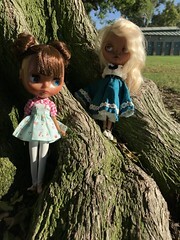 I really enjoy dressing my dolls, and I will often redress the girls all on the same day. 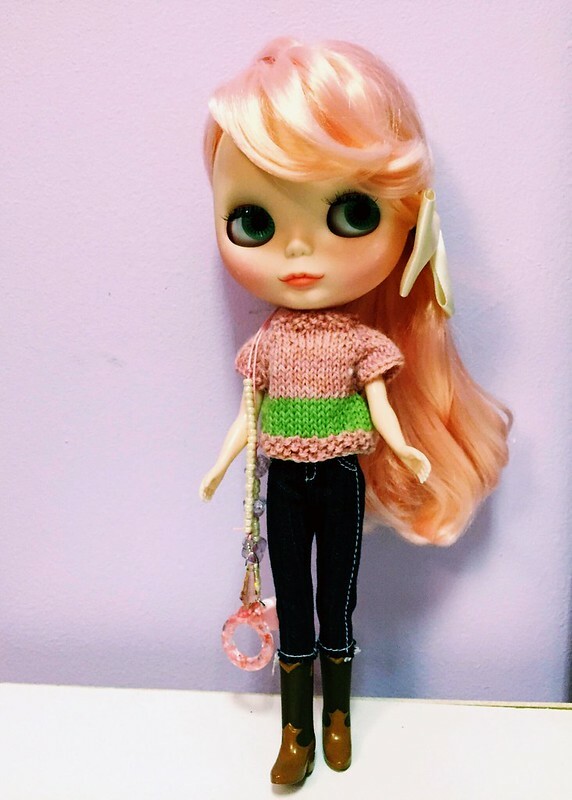 It’s become something of a ritual for me, where I’ll pull out all of my boxes of doll clothes, shoes, and accessories, sit down on my bed, and slowly coordinate an outfit. Sometimes an outfit will suit the dolly’s designated personality and style, and sometimes it’s a complete fashion miss, but doing this wardrobe change often helps me cycle through all the pieces I’ve accumulated in this year. 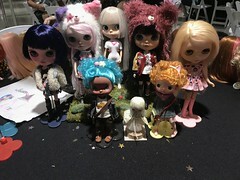 This activity is also stress-relieving for me, and it helps me bond with my blythes. Speaking of bonding, I thought I’d do a bit of an introduction of each of my girls as I’ve come to fancy them ^^. Finley – She’s a bit of an odd one. She’s my only stock girl, and real release (Cadence Majorette). I had thought she’d be an outgoing, tomboyish, adventurer type, but then she became the older sister – the easy going, patient, quiet and lady-like one. Honestly, I’m not entirely sure that’s who she is either. 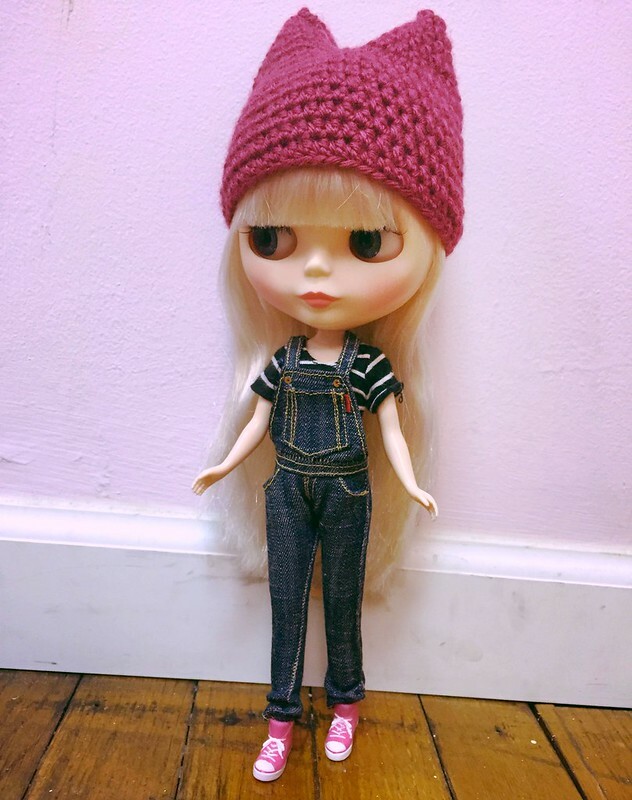 Finley is wearing: hat crocheted by me, striped t-shirt I purchased in a lot on eBay, overalls by Reve de Rui, and pink converses from the Simply Guava stock. I’m actually not sure who she is at all yet, and that’s tough! I’ve had her the longest out of my girls, and I still can’t pinpoint her personality or style. 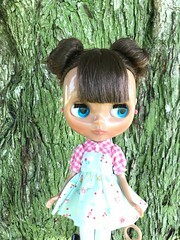 I think part of my difficulty is that I purchased her as my first doll because I thought she would be a good first blythe doll. 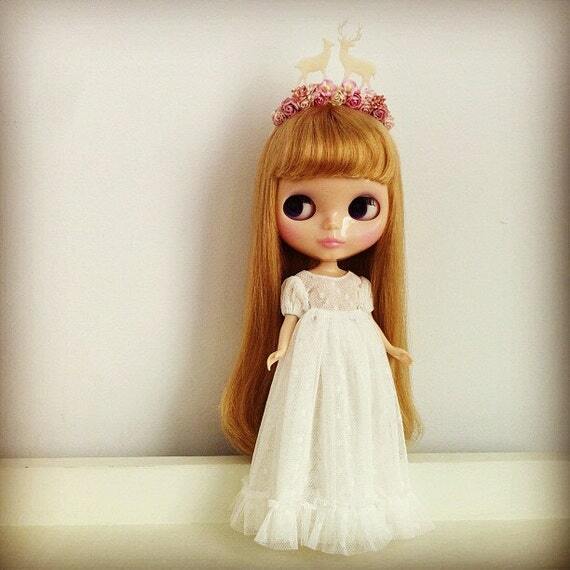 I would get a feel for what being in the blythe hobby was like, without breaking bank. She remains stock because I can’t bring myself to carve her or alter her irreversibly. I’ve changed two of her chips and spray matted her face, but that’s it. The only thing that this girl is attached to is her name, and that she likes to daydream, she’s easy going, and she likes to try new things. 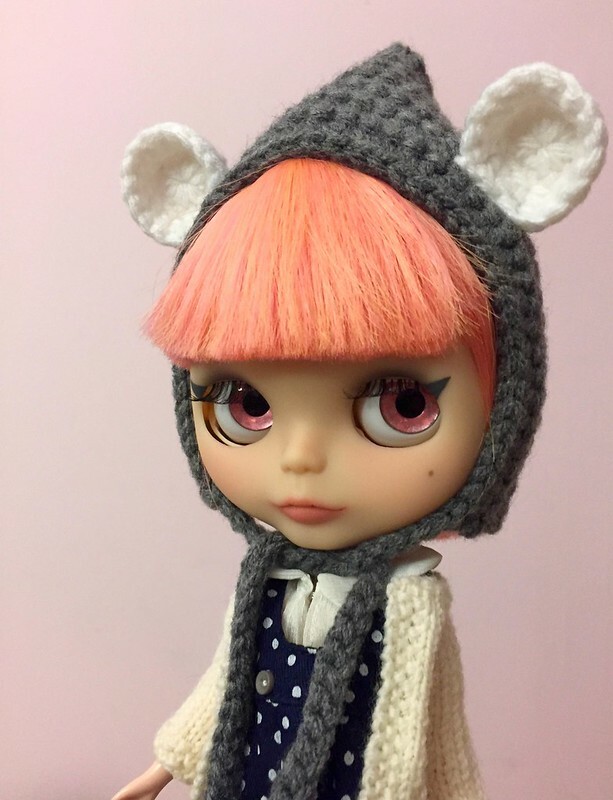 Rosaline – She’s a super girly girl. She loves sparkly things, and she’s very excitable. She loves the color pink, pinafores, polka dots, play dresses, ruffles, and fairy tales, and heroes. She has a strong personality, and is apt to fighting to get her way or going off alone. I dreamed her up while marathoning Steven Universe. She’s based on an original character of mine, as one of Peridot’s successfully forced fusions. Her separate shards were able to successfully sync with one another because of each of the fallen warriors’ strong desire to carry out Rose Quartz’s will to protect the Earth. Rosaline is not a sum of her parts, but an entirely new crystal gem, born in the Kinder Garden, unknown to Home World. She quickly befriends Steven, is seen with suspicion by Pearl (because she resembles Rose) and Garnet (because of the nature of her birth), and begrudgingly accepted by Amethyst (because of their shared birthplace and Rosaline’s resemblance to Rose, but begrudgingly because she is bringing disharmony to the group). Rosaline is wearing: knitted top I won from a Blythe Life giveaway, jean capris I purchased in a lot on eBay, and Country Summer’s stock boots. Bryn – She’s a tough girl in a small package. She will take no sass from you. Although she’s the younger sister in the group, she’s also quite mature, but also kind of bossy. 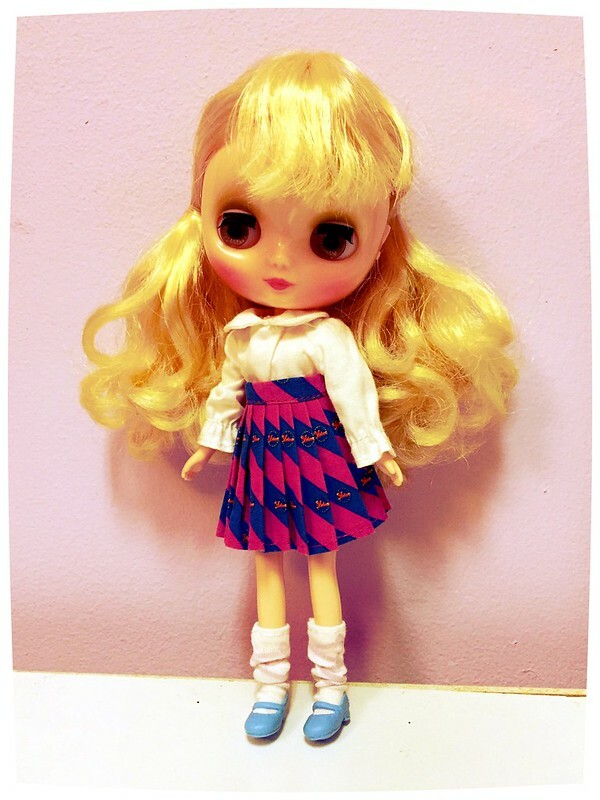 Bryn is wearing: Alicia Cupcake’s stock blouse, socks, and shoes, and Yeolume Podo stock skirt. 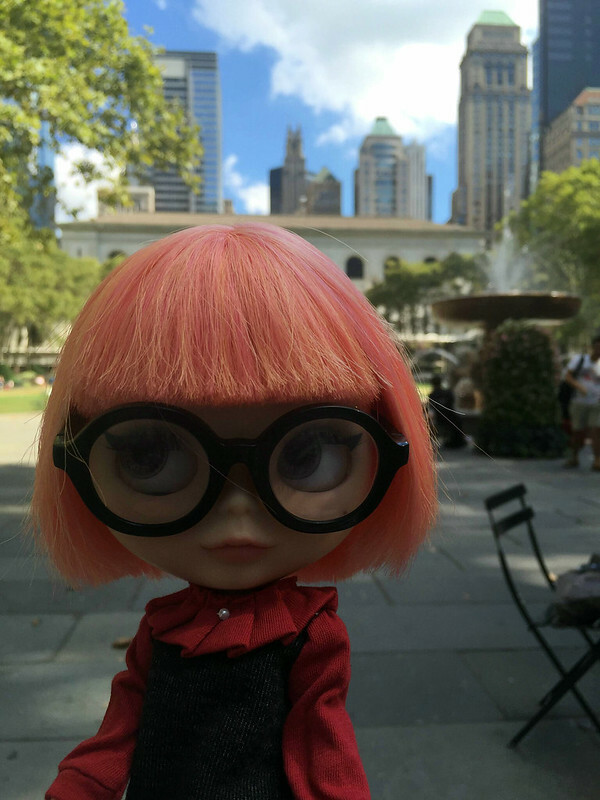 Rory – She’s the resident hipster-librarian closeted-otaku. She loves vintage, glasses, and old timey things. She’s bookish, and quiet. Rory is wearing: knitted cardigan I won in a Blythe Life giveaway, Sugar Mag collared undershirt, Les Jeunette’s stock pinafore, Ice Rune’s stock hat, and Cadence Majorette’s stock shoes. Marina – She’s the resident mermaid. Her look is ethereal, confident beauty. Marina is wearing: long sleeve top and shoes I purchased in separate lots on eBay, and a crocheted skirt by me. Marina is definitely getting changed again this weekend when I pick up my etsy order from the post office. She’s a bit too casual for my taste, but I really don’t have much in the ways of a wardrobe for her in my current clothing collection. Hopefully, Marina’s stand will come soon too! I think it’s a little funny how I’ve written more about the dolls I’ve had longest, and less and less as the list goes down. I’m still getting to know my girls, and I like that their individual “auras” or vibes are different from one another. ROAR my posts are all so long and ramble-y! I hope everyone has an awesome day tomorrow! I recently purchased the Nintendo 3DS game Story of Seasons. It’s made by the same company that makes the Harvest Moon games (repping Harvest Moon since SNES yo), and I would even put this game in the same universe as the Harvest Moon series. So far, I’ve logged about 40 hours into the game, and I’m at the tail end of the Fall season of the First year. I know… it’s exactly how it sounds… I spent 40 real life hours playing a game where I’m a farmer on a farm in a quiet little town. I actually named my character after my cat, and my character’s hairy brown cat after me. 😀 So technically, my cat is living the farm life, and I’m living the life of the cat. The objective of the game is to run a successful and competitive farm, boost the town’s economy by opening trade with other countries and increasing tourism. As a new member of the town, you’ll also want to make friends with the townspeople and even marry one of the eligible bachelors or bachelorettes of the town. My character’s waifu. Check out those pink flowers. 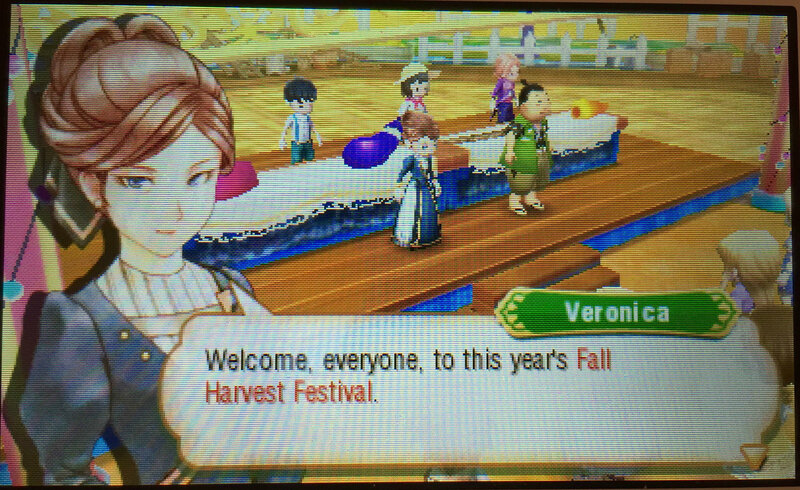 There are a few subtle differences between Story of Seasons and the typical harvest moon games, some I like and some I don’t. You can choose from two difficulty levels (easy and normal). I’m playing on easy mode, because apparently I like to farm to relax. There is so much character customization! 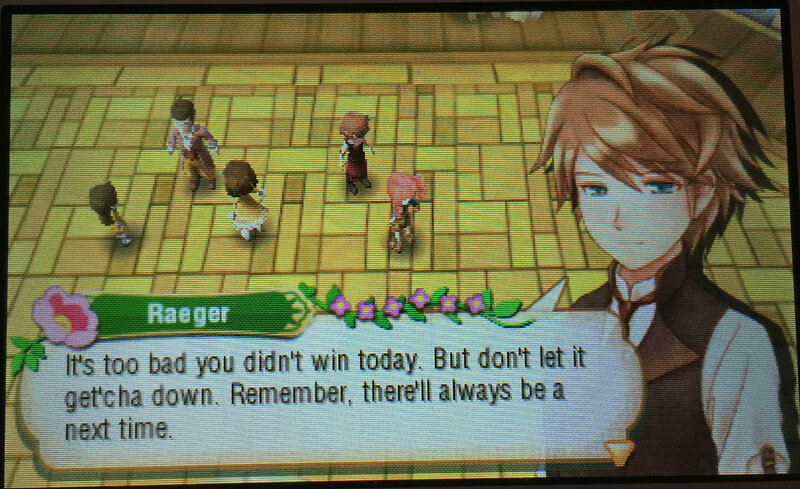 This aspect is a bit lacking in the Harvest Moon series. In Story of Seasons, you can change your clothes and your physical attributes (hair color and style, face type, skin tone). There’s also a world building aspect. You can change the appearance of your farm, your home, and the town. I’m not sure if this is entirely a new function (>_< I actually haven’t played the last one or two releases. I think the last HM game I played was The Tale of Two Towns. ), but I like that you can see your friendship levels with the townspeople by pressing the upper left button when near the npc. Very handy. Similar to the HM games, there’s a lot to do. Farm life is not idle life. There are reverse confessions! And reverse marriage proposals. That’s got to be a first. There aren’t any love rivals. In some of the other HMs, you can trigger cutscenes between one of the potential marriage candidates and your respective rival in love. These cute romantic cutscenes enrich the game, and I like to see that the NPC’s lives don’t revolve around my character. Without this aspect, I feel like the lives of half of the characters remain stagnant after my own character chooses her path. I guess it’s just as well. I always found it both hilarious and sad that there was always one female NPC without someone to marry, all because my character decided to uproot her life and come waltzing into town, making the total number of young people uneven. LOL. There’s no mining cave… just a single sad little vein to “mine” from that’s like a cornucopia of gems and stones. There may even be too much going on – I’ve noticed an influx of new animals you can own, you can rent crop fields, there’s a safari (kind of like the safari in pokemon, except way smaller, and mostly used for scavenging), you can own your own trading stall, you can edit the appearance of your home, your farm, and the town, and that’s all I can think of off the top of my head. I mean, I’m not even through year one and I’ve already logged a ton of hours. My next 3DS game purchase will most likely be the new Animal Crossing game, which if it’s anything like it’s predecessors, is a game about paying off the mortgage to your house :D.
I decided to update my dolly shelf today. I’ve accumulated some miniature items from Michaels over the past year that have just been sitting in a box. I’m not yet up for creating an entire room, since I’m lacking most of the materials I think I would need. I do plan on moving within a year, and I also expect moving something as delicate as a Blythe room might be problematic. SO! 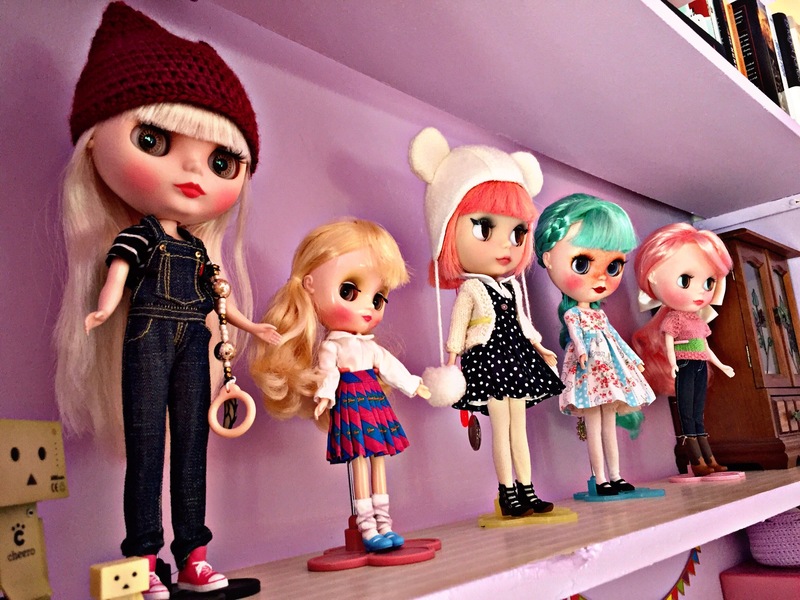 My girls will have to make due with their dolly shelf ^^. 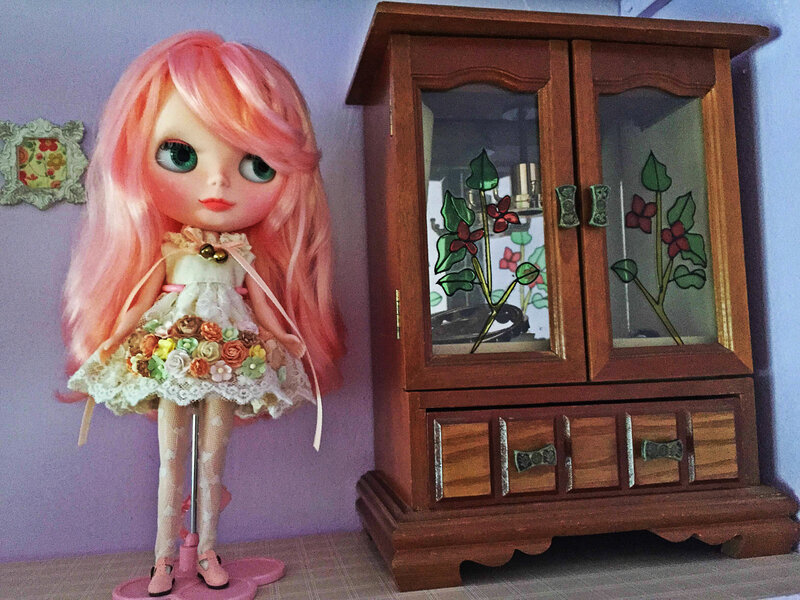 Currently, my blythes live on one of the top shelves that are built into the wall of my room. I lined the shelf with some contact paper, and I taped up some mini frames onto the wall. 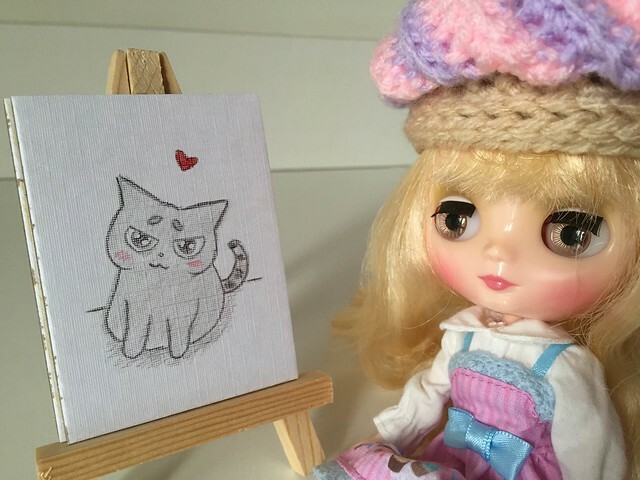 I’ve also been meaning to draw something on the mini easel, so I’m glad I got around to doing that today. I also found something very exciting in my basement! It’s a jewelry box that plays music and it looks like an armoire! I remember seeing this around back when I was a little kid, and since it wasn’t in use, I asked my mom if I could have it. It now currently houses my own jewelry and trinkets, and is sitting on the doll shelf. I love how to scale it is, and for something that’s nearly 25 years old, it’s in really good condition… and now it is MINE :D. No backsies, mom. Lastly, my sample Moo cards came in today! They almost look like trading cards. 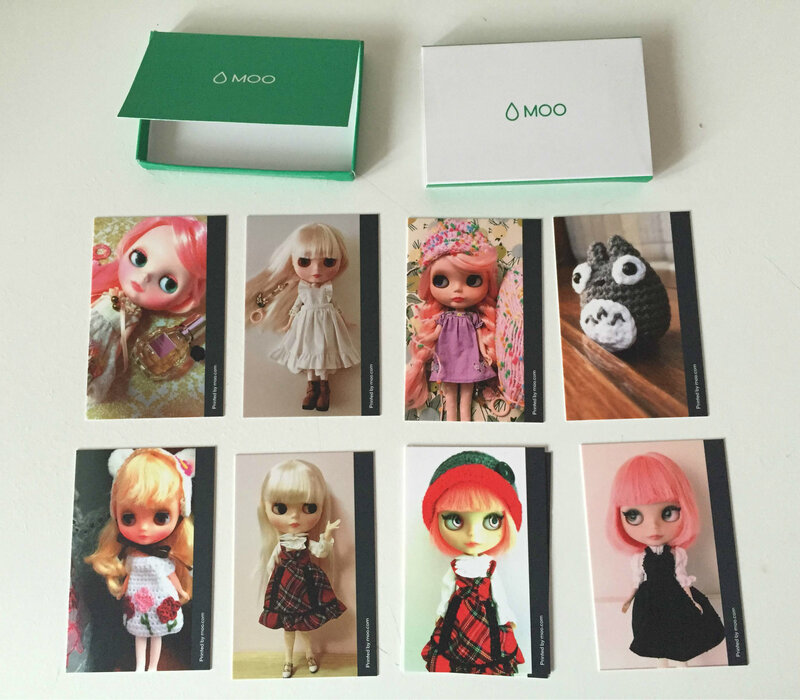 I made sample Moo business cards using their promotion – you can order a sample of 10 business cards of your own design for free. 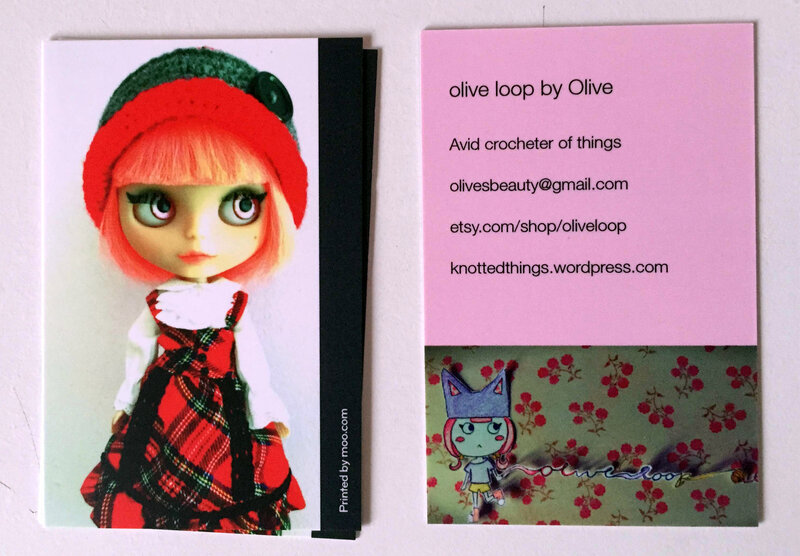 I’ve only ever seen business cards by Moo once, and I wasn’t sure this was something I would use for my etsy store. I decided to try ordering the sample first, to see how I feel about them. My order consists of 8 different designs, with the business card being portrait style, rather than the traditional landscape. The finish of the cards are matte (I wish I got some with the glossy finish). I didn’t really have a solid idea of what I would want my hypothetical business cards to look like, so I just picked photos I’ve taken recently that I liked and used them as the design. I also kind of winged it for the writing on the back. I’m not entirely happy with the little image on the bottom of the card back. I need to work on a cleaner looking logo for my etsy store. I have some rough sketches of what I might want as a logo, but nothing finalized. I really like these cards! They’re super cute~. My mom actually took one to use as a bookmark. In the future, I might include them in packages when I ship out orders. I would definitely recommend Moo cards if you’re in the market for nice business cards. I’m not sure how competitive their prices are, as I haven’t done the research, but in terms of the finished product – the cards are printed on stiff paper, and they feel luxe.